Simple, durable and efficient, the HCR1800-EDII series incorporates a self-adjusting drill system that ensures high productivity no matter what the drilling situation. The HCR1800-EDII allows you to choose from two different drifters, depending on your specific application needs. Low-emission Tier IV CAT® engine offer low fuel consumption and meets US exhaust emissions regulations. Whether you choose the HD828 drifter or step-up to the HD836, you will benefit from dependable performance and easy operation. With FRD’s TFSS (total fuel savings system), the operator selects the optimum engine speed for the application, allowing all fuel savings functions to be automatically managed during drilling operation. Advanced rotary rod changer allows easy drill rod changes. Operators can add and remove rods using a single lever. 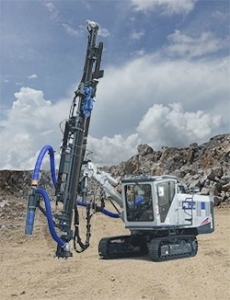 HCR1800-EDII features 12′ or 14′ rods with extendable boom for increased drill pattern. Heavy-duty undercarriage – featuring a pentagonal section design to reduce dirt build-up and track wear – ensures strength and durability. Reliable dust control system increases suction capacity and provides effective pre-cleaner to reduce escape of drilling dust. An optional dust suppression system is available for difficult drilling conditions. Choose from an HD828 or HD836 drifter to meet your specific application needs.